Do you ever try to recreate meals you've had while traveling? I'm not a cook (that's an understatement), but I do try to incorporate little touches that bring my senses right back to a fantastic menu. As for the morning meal at the Farmhouse Inn, let me start by saying... off the charts fantastic! How'd we get here? Pop over to this post to start reading about when my friend Nahmi and I spent our birthdays in Sonoma County. You know how Hobbits have first and second breakfasts? 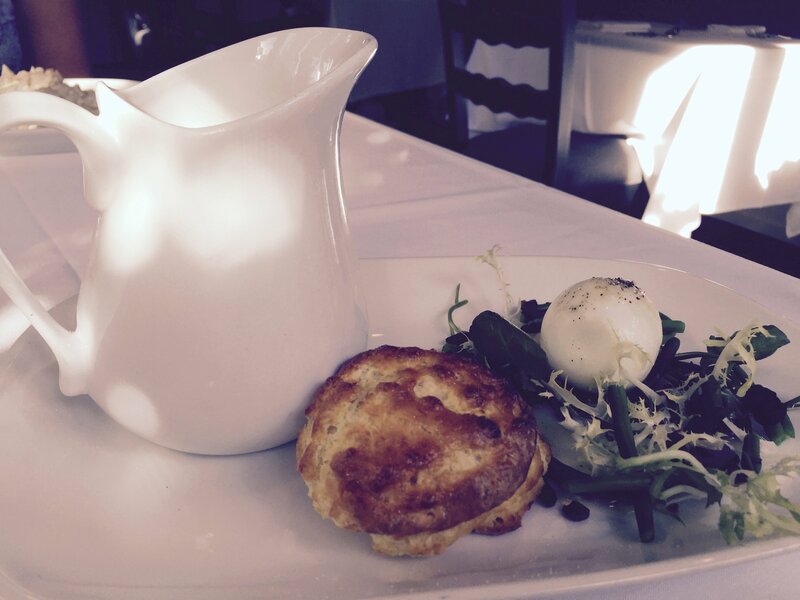 Farmhouse, An Inn, Restaurant and Spa has them beat with THREE! Let's begin with setting the mood via a morning stroll to the Restaurant. 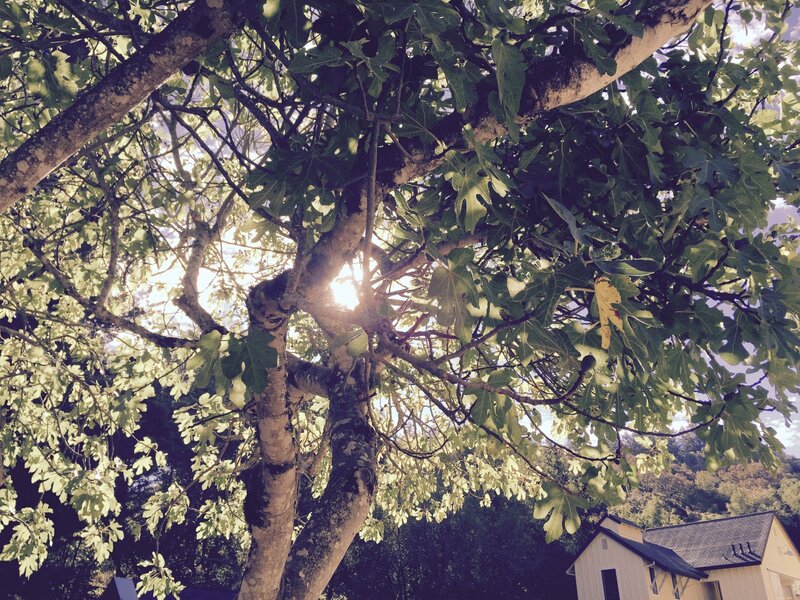 See the sun peeking through the trees? It's gonna be a glorious day. Why hello, ladies! 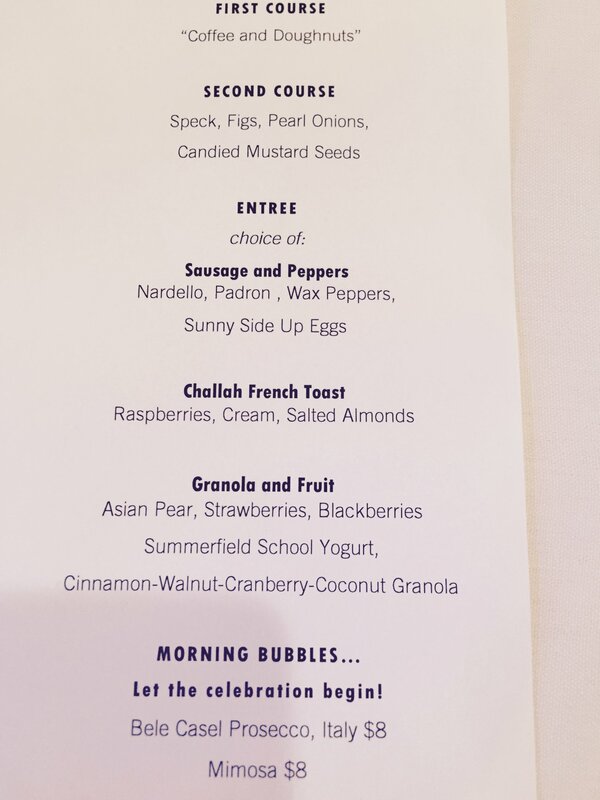 I'm guessing we should thank you right now for what will be waiting for us on the breakfast table. Inhale, please. Yep, the morning dew touching the fragrant herb garden results in a stomach alert: Hungry now! Coffee. Tea. Juice. 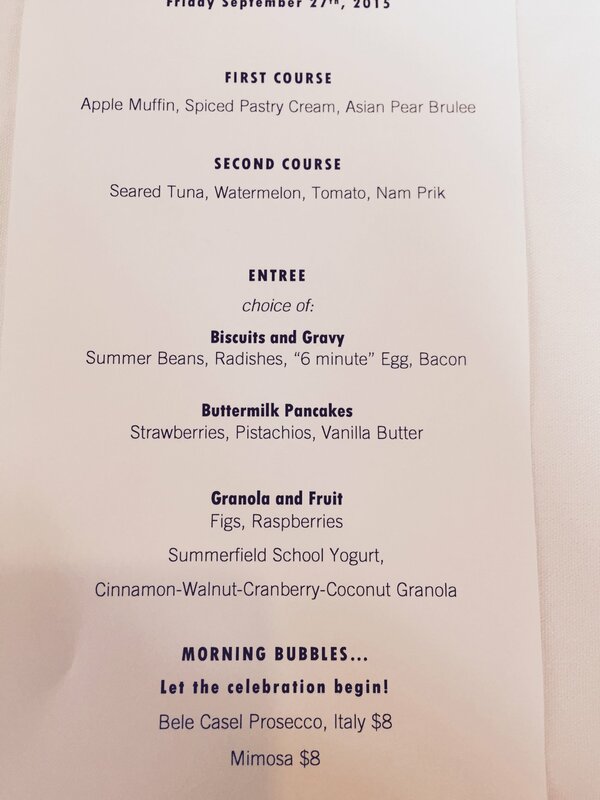 And (drum roll, please) the menu. You're reading correctly. THREE COURSES! For breakfast! What was Estate Chef Trevor Anderson serving up this particular morning? 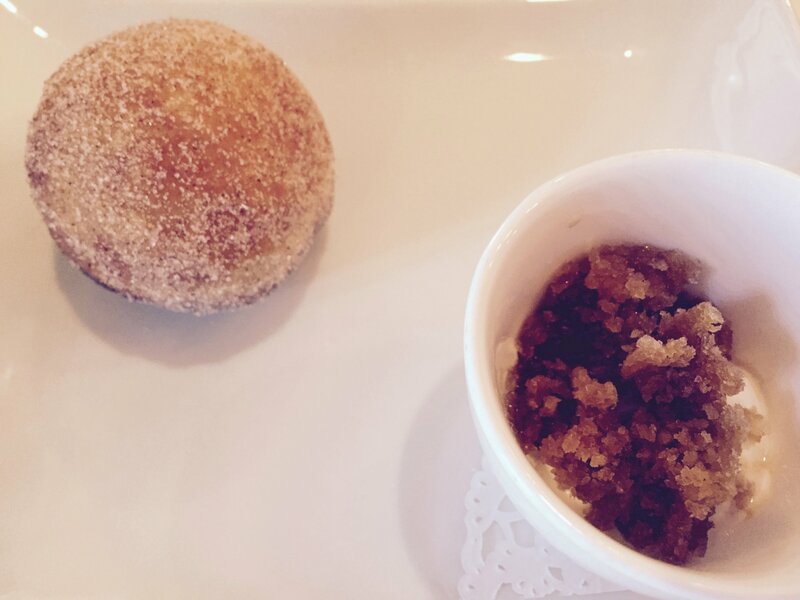 This hot pillow of goodness in the form of a doughnut paired with an icy coffee granita would have been enough alone, but... there was more! 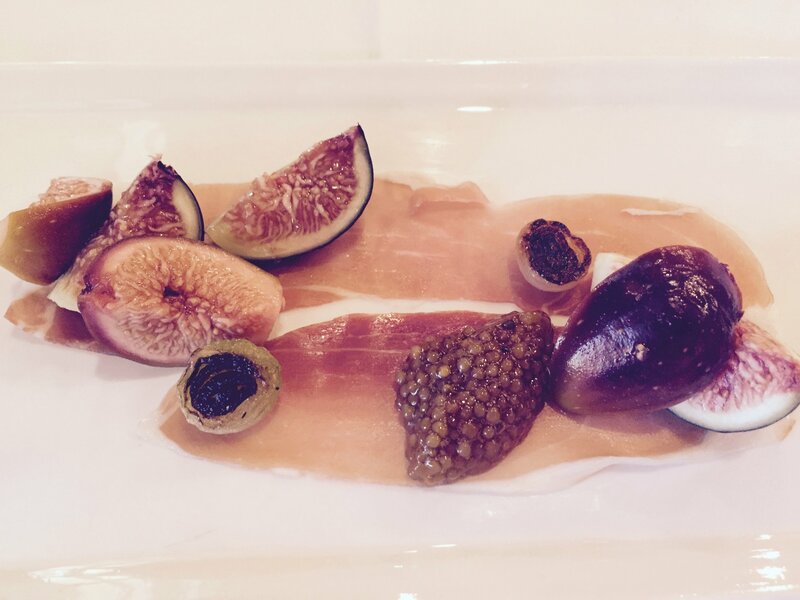 Right when you need it, a touch of protein by way of Speck (think thinly-shaved ham) accompanied by Figs, Pearl Onions and Candied Mustart Seeds. A stream of drool just hit my keyboard over this memory. As you could see from the menu above, there were three entree selections from which to choose. Great way to torture two indecisive Libras on their birthday getaway! The smart thing would have been to each choose a different main dish and share. We were on vacation. To hell with being smart! 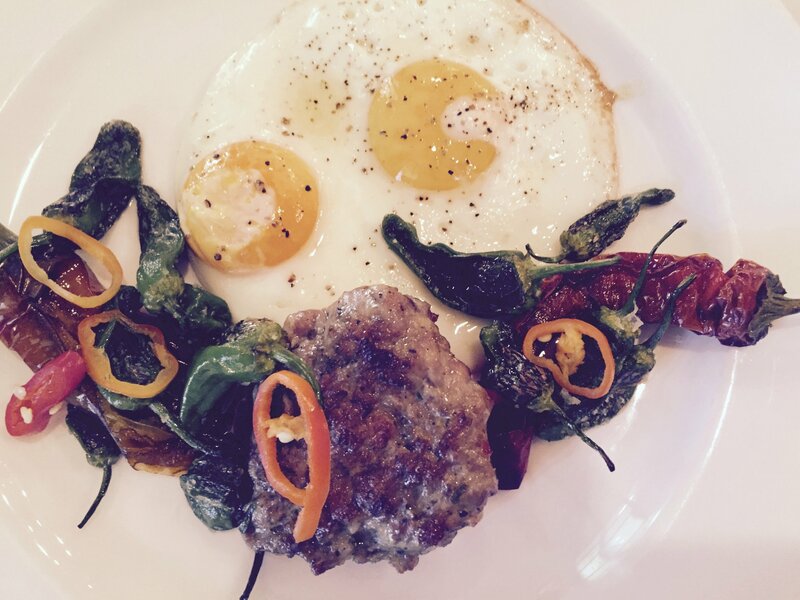 We both went for the Sausage and Peppers with Nardello, Padron, Wax Peppers and Sunny Side Up Eggs. It may not look all that pretty in the photo above, but the flavors were KAPOW! They left me wondering about a particular ingredient. Another morning of "three breakfasts!" 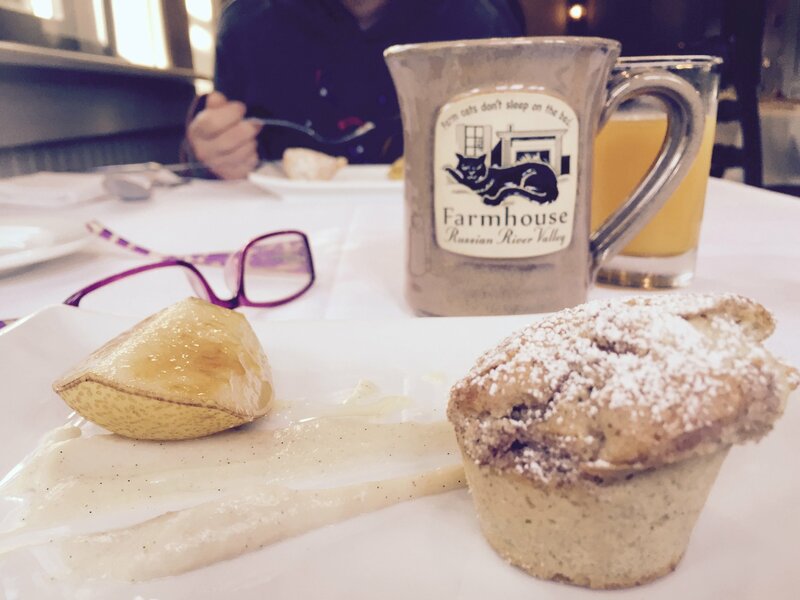 Despite the amount of deliciousness that constituted this birthday weekend, we went to bed dreaming about the Farmhouse Inn breakfast. Day two did not disappoint. A warm Apple Muffin flirted with a slice of Asian Pear ice skating on the edge of some Spiced Pastry Cream. Add a sip or two of coffee and... perfection! 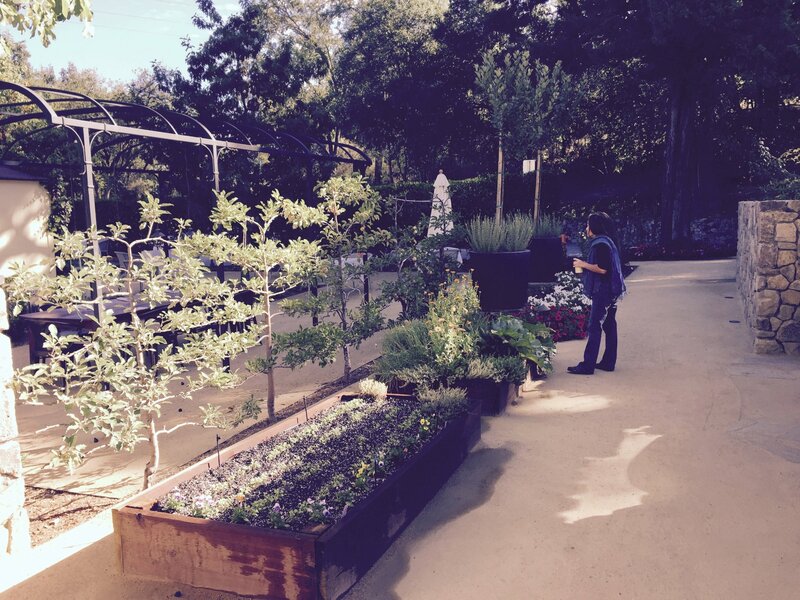 Remember that herb garden from yesterday? 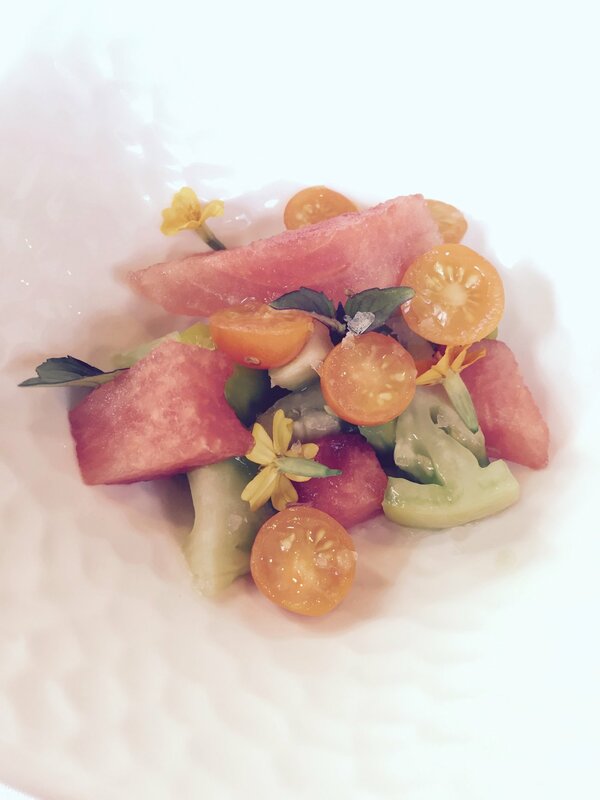 It contributed to the second course of Seared Tuna (excluded for my seafood/fish allergies) teamed up with Watermelon, Tomato and Nam Prik. We'd googled Nam Prik (much as we had with Speck the day before) and learned it's a chili-based spice. Now you'd think we'd have learned from the day before about the upside of sharing entrees so we could try more than one. Nope. We both went for the Biscuits and Gravy (Hello! I'm a southern girl!) with Summer Beans, Radishes, "6 minute" Egg and Bacon. "What is the salt your using???" I'm no salt aficianado, but whatever Estate Chef Trevor Anderson was using had me needing some of my very own. The following was brought to the table. Oh yeah. I wanted some. In a big way. Well, not as big as that bucket. This post started with talking about how I try and bring a bit of my travels home via the plate, and it's ending that way, too. 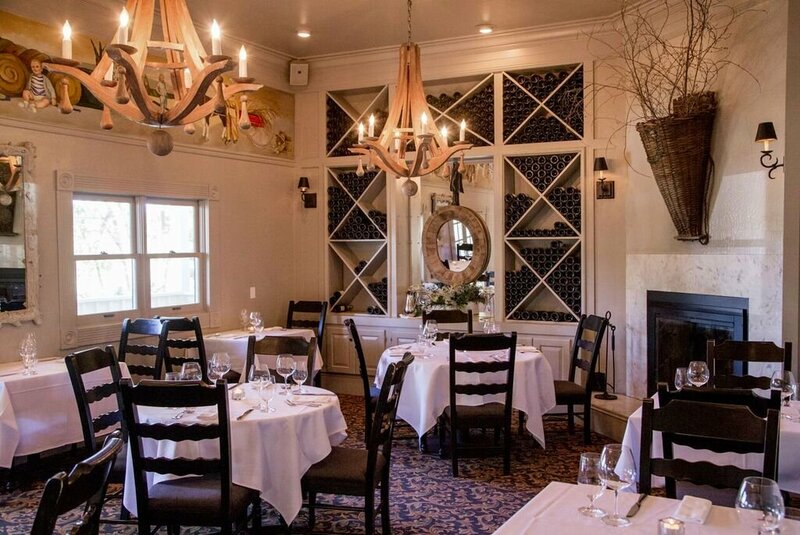 A phone call with my friend Susan led to me singing the praises of the Farmhouse Inn's salt. "Was it Maldon Salt?" she asked. How did she know?!?! 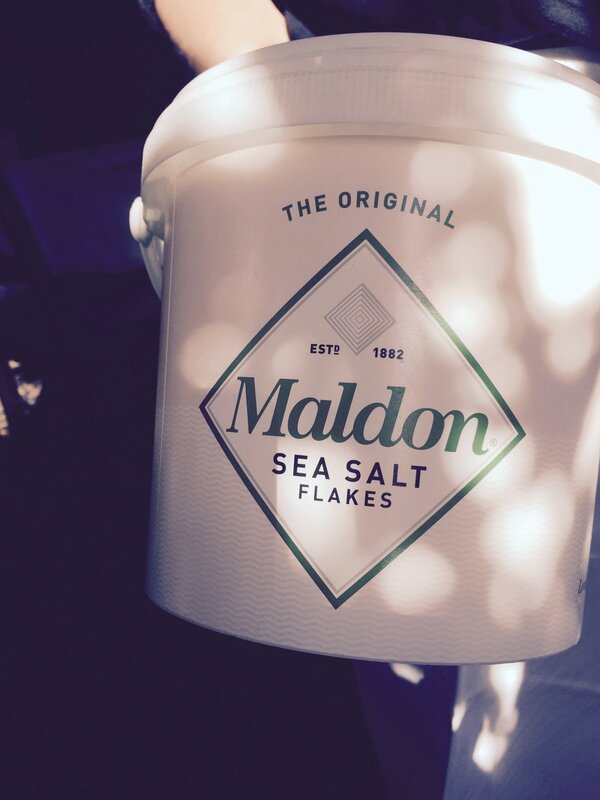 Turns out, the Cupid's Arrow that is Maldon Salt has struck many people's tastebuds. 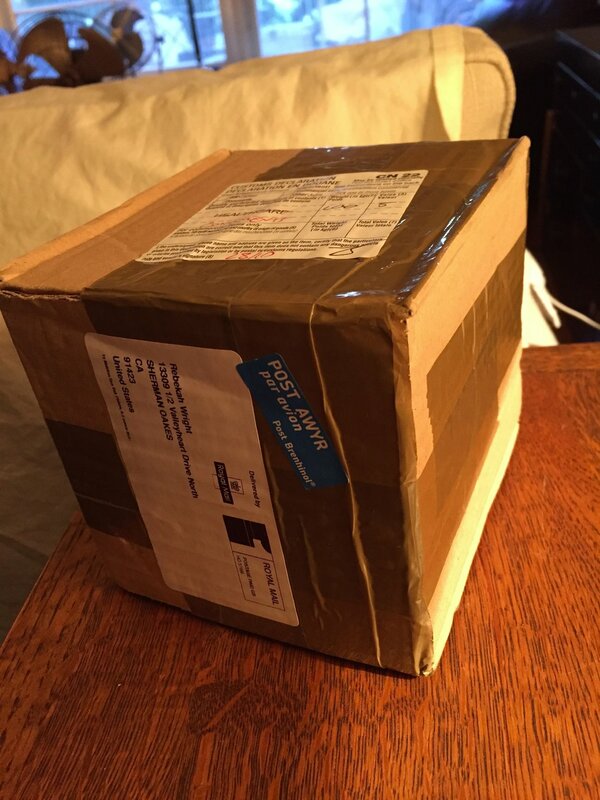 Not long thereafter, the following package from the UK arrived on my doorstep. 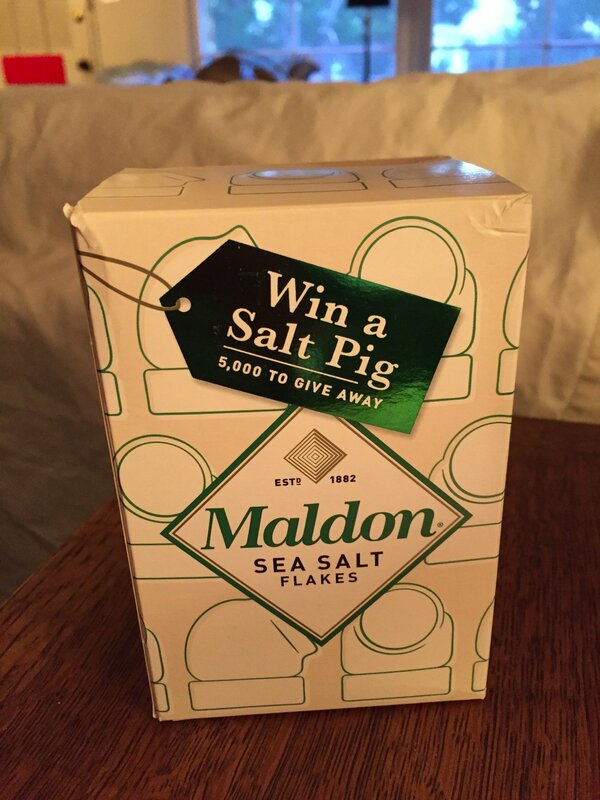 Susan sent me Maldon Salt (and a cool pepper mill with peppercorns) for my birthday! 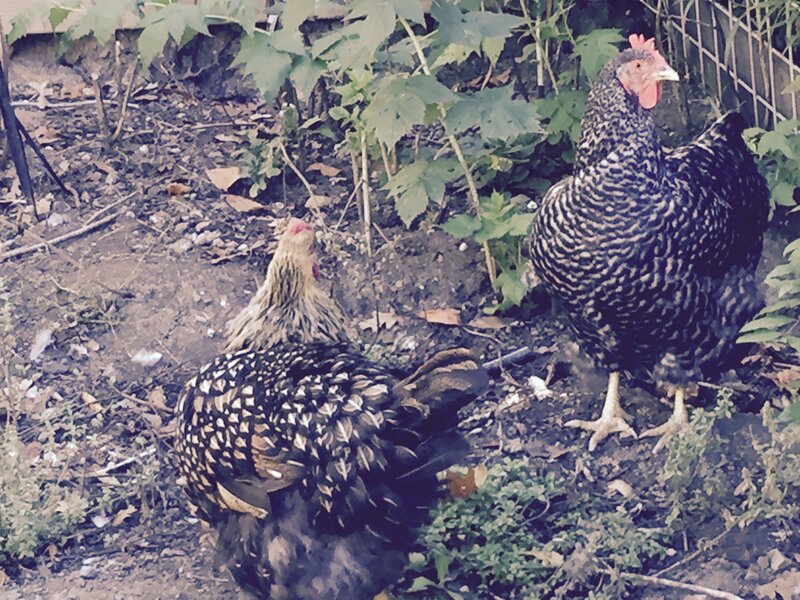 I may not have three breakfasts every day, as Nahmi and I did at the Farmhouse Inn. 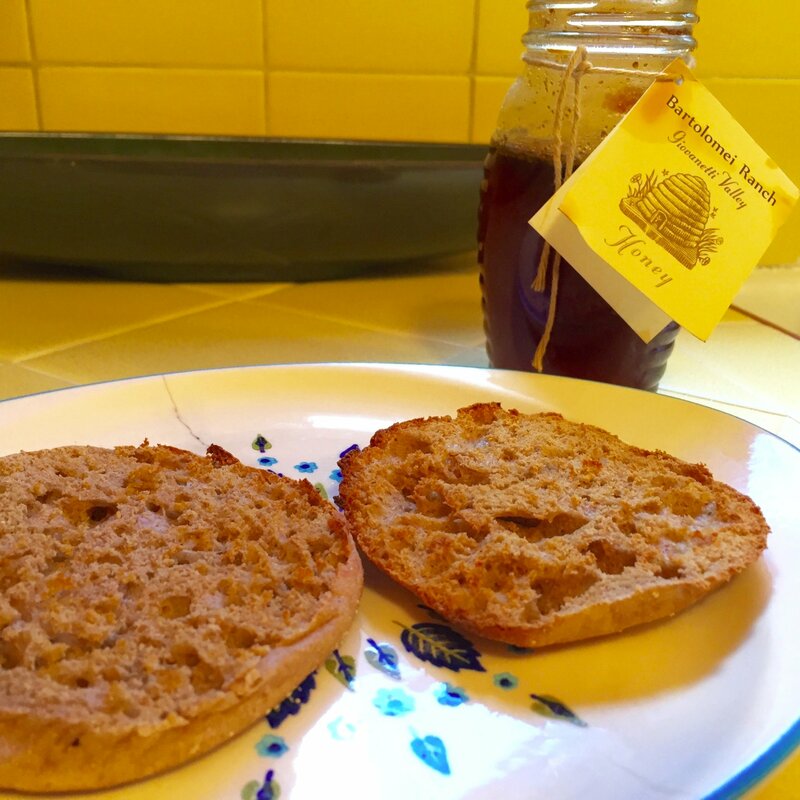 Between my Bartolomei Ranch honey and Maldon Salt, though, my heart races back there most mornings.